In honor of the 20th Anniversary of the Reign of the Supermen story, I am recounting the story to the best of my memory. It is meandering and not entirely accurate. You can read Part 1 here. So there are four dudes running around claiming to be Superman. Actually there are two dudes claiming to be Superman (the Cyborg Superman and the visor-wearing Last Son of Krypton), a teenage punk that claims to be a clone of Big Blue and insists on being called Superman (Superboy), and a guy wearing steel armor that bears the S shield to carry on Superman’s legacy (Steel). Things start off with the guys having their own adventures fairly separately, which is kind of weird. Even in a city as big as Metropolis, you’d think that if four guys were claiming to be its greatest hero back from the dead that they would run into each other fairly quickly. The Cyborg Superman establishes himself as the frontrunner out of the gate. Superman’s science buddy Dr. Emil Hamilton says that the Cyborg Superman is a DNA match with the original and his technology is Kryptonian in origin. Also, the Cyborg Superman saves Bill Clinton and the White House from an attack getting the Presidential seal of approval. Let me repeat that: Bill Clinton. This was actually not our 42nd President’s first appearance in Superman comics. He and Hilary Rodham Clinton spoke at Superman’s funeral. Imagine if that happened today. Twitter and Facebook would explode. If Barack and Michelle Obama spoke at Superman’s funeral, 30 minutes of Fox & Friends would be dedicated to why John Boehner didn’t get to speak as well. Rush Limbaugh would be dismissing Superman as a no-good illegal alien. 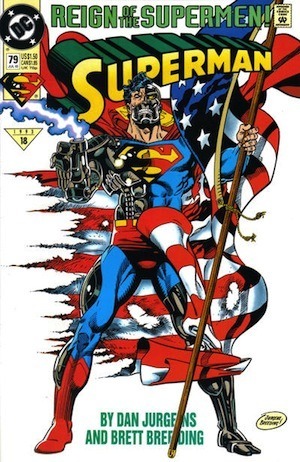 So anyway, Cyborg Superman saves President Clinton and gets the thumbs up from 42. Oh and the front runner in the Superman Sweepstakes also breaks into Project Cadmus, steals Doomsday’s dead body, straps him onto an asteroid, puts a tracking device onto gray alien beast, and hurls him off to the outer reaches of space. The payoff to this seemingly random moment would come a year later. Guy Gardner—one of the few members of the Justice League that wasn’t maimed, de-powered, or killed in the Doomsday battle—is upset that the Last Son of Krypton is claiming to be Superman. He solves it in the calm, rational way that most comic book characters solve things: punching. But then after they fight, Guy Gardner decides the visor-wearer is the real deal. So if you’re keeping score at home: Cyborg Superman has the approval of the scientist that best knew Superman and the President of the United States and the Last Son of Krypton has that guy who was the Earth’s 3rd string Green Lantern back in the 80s. Steel? Well, he’s not actually Superman. Yet Lois Lane herself thinks that he is the closest to the actual spirit of Clark. Superboy? He flirts with Supergirl (who is dating Lex Luthor II, which is actually the brain of Lex Luthor in the body of a clone who is an Australian with a glorious mane of red hair; another story for another time). Despite Superboy’s brazen violation of the Bro Code (even if the other Bro is an evil mastermind, it is still a transgression), Supergirl eventually tells the media that the kid’s alright. So that sets the table. Everybody has some sort of influential figure that says, “Hey, this guy is the real deal” or “Hey, this fellow does a fine job carrying on the legacy of Superman.” Now it’s time for our Supermen to start encountering each other. And you’re not going to believe it, but there is some fighting that’s going to happen. Steel finds himself in tussles with both Superboy and the Last Son of Krypton. Despite being the only one to not possess superpowers, Steel holds his own and the other two decide that he’s alright. That is because the guy behind the mask of Steel, John Henry Irons, is awesome. I still hold a grudge against Shaquille O’Neal for making such a crappy movie about such an awesome character. But then, our story takes a turn. Cyborg Superman and the Last Son of Krypton head out west for some reason. Perhaps they were going to hash out which was the real Superman over some In-N-Out burgers, I don’t remember exactly. Wait! I think they were going out there to deal with some alien threat. So they get there and discover that these aliens are planning on laying waste to Coast City, home of Green Lantern (Hal Jordan). Not only that, but Cyborg Superman is a bad guy! The bad guy! I know! 10 year old Chris never saw it coming. Cyborg Superman blindsides the Last Son of Krypton with an attack and seemingly kills him. Meanwhile, Coast City is utterly destroyed. There are no survivors, which had ramifications in Green Lantern comics that lasted well over a decade. The alien that lead the destruction was the classic Superman villain Mongul. And yet, Cyborg Superman doctors footage that makes it look like the Last Son of Krypton was behind the destruction of Coast City. And everyone believes him, because there is seemingly no Last Son of Krypton to refute him and the Cyborg Superman has most everyone believing that he is Superman returned from the dead. In fact Superboy says as much before he heads off with evil half robot Superman to survey the damage. While there, Cyborg Superman beats up the kid and holds him hostage in the massive alien structure being built on Coast City’s remains known as Engine City. So of our four Supermen: one is horribly, horribly evil, one is probably dead, one is kidnapped, and the only good one left is a guy that doesn’t even have superpowers. If “Reign of the Supermen” is the Star Wars trilogy, we have hit our Empire Strikes Back. Who will stop the Cyborg Superman? Who is the mysterious man in black that has been watching all of this from the Antarctic? Where on earth was Green Lantern or any of the other superheroes when the Coast City disaster went down (seriously, between this and Doomsday, they aren’t exactly having a great year)? How does To Kill a Mockingbird hold the secret to all of this mystery?